We are very fortunate here at the shop as being based in Maidstone allows us to fish the South East corner of Kent whatever the conditions might be. There is always somewhere on the South East coast to go and find some shelter and reap the rewards of our great coast line. It doesn't matter if the wind is from the North, the East or Southerly we can always fish for Bass, Bream, Cod, Conger, Dab, Dogfish, Flounder, Garfish, Mackerel, Mullet, Plaice, Pollack, Pouting, Rockling, Scad, Silver Eel, Smoothhound, Sole, Turbot, Whiting and more. At the shop we have up to the minute reports coming in to us so we always know where is fishing and what's being caught - want to know? - just ask ! With decades of experience in Beach, Boat or Estuary fishing we can help. 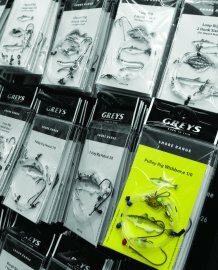 We stock all the major brands and maybe a few specialists ones that might be new to you. Give us a call, drop us an email or pop in. To get good results on the beach you will need to be aware of the tides. Firstly you will need a tide table like the one here that we sell. Now you know the high tide times for this area just look at the list on the right for the best time to fish - Good Luck ! Mackerel are in all over the SE Coast. Have you tried fishing at Sandgate. It's a clear venue with the choice of fishing within the rocks if you fancy it. Also plenty of parking - what more could you want. We have Sidewinders in stock. A decent selection of sizes, shapes and colours. The Summer might be ending soon but the good thing about that is that the Cod will not be far away.